Ever since news arrived last summer of our son’s expected delivery, my wife Sonya started journaling about the whole pregnancy experience, which has now evolved into a Raleigh thrifty parenthood blog as we learn how to best provide for our family in a socially responsible and budget-conscious manner. Entries touch upon parenting subjects such as cloth diapering, decorating, renovating, and more recently recipe experiments. As a dutiful and loving husband, I’m more than happy to help out with the occasional photography assignment for the blog. Last night, she had an idea for a new entry about the bounty of our local CSA‘s weekly haul (we got a double share this week) and subsequent recipes had us posing vegetables as interestingly as vegetables can possibly be posed. Now as a three month old, our son North has become the grounding center of our universe. Our North star, if you will. So it comes as no surprise that he ‘found’ his way into this latest picture. To set up this shot was actually fairly simple: Sonya did a great job staging the larger vegetables on a clear circular platter and placed the arrangement on a picnic table. The creme pea shells were piled next to the platter, and North got in on the action resting on the pile of peas. Of course Sonya made sure North’s pockets and hands had the appropriate props. To shoot, it was simply a matter of standing on the picnic table bench and holding the camera overhead, about 3-4 feet from the subject with the lens at 18mm. The light was soft to begin with as it was dusk, so for fill light simply used an attached SB-800 strobe with its diffuser, pointed backwards (or upwards in this case). As it happens, over the picnic table there is an overhanging eave painted white that worked as a fantastic reflector. The resulting fill was nicely balanced. So what have we learned here? 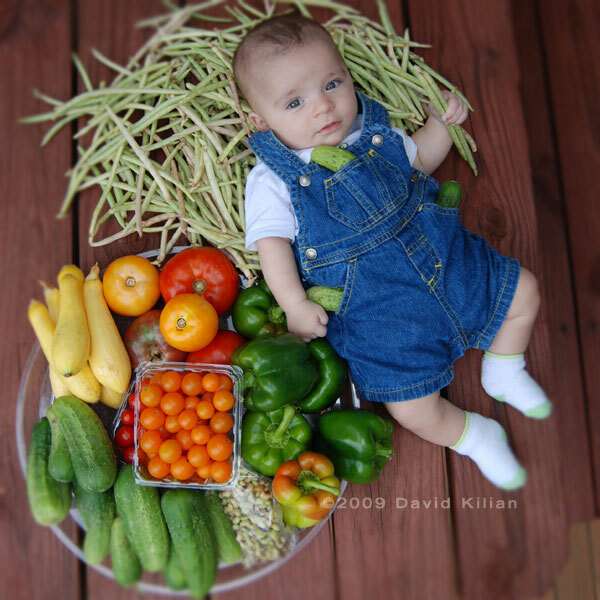 If you want to make vegetables a little more engaging, just add a cute kid. This entry was posted on July 23, 2009 at 7:28 am and is filed under food, photography with tags csa, food, parenthood, photography. You can follow any responses to this entry through the RSS 2.0 feed. You can leave a response, or trackback from your own site.